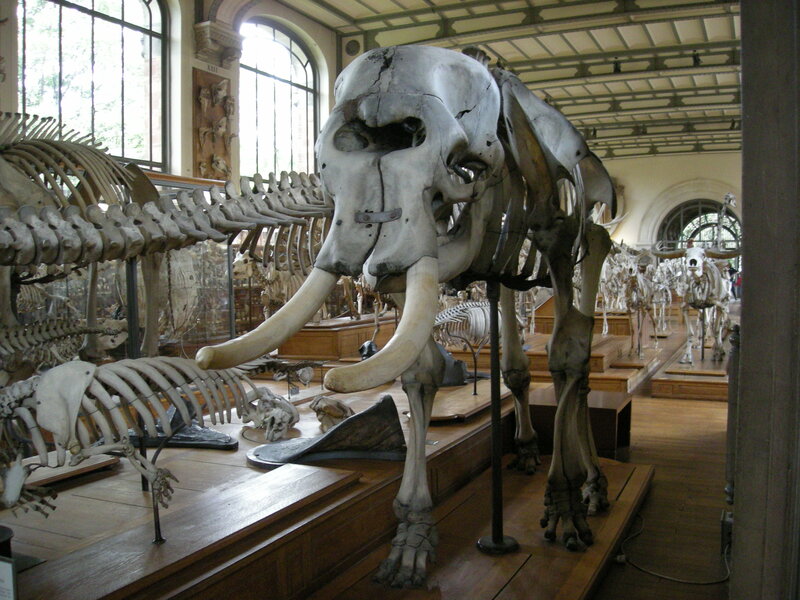 Last month, someone broke into the Paleontology wing of the Paris Museum of Natural History, and used a chain saw to cut off one of the tusks of the elephant skeleton there. The skeleton dates from 1681 and is the oldest specimen at the museum. Here is a little on the skeleton’s origins, from my just-finished book, The Courtiers’ Anatomists, and a picture I took of the skeleton last summer, with both tusks. The anatomists from the Paris Academy of Sciences set out for Versailles with many tools and crates in the dark early morning of Wednesday, 22 January 1681. When they reached the château, the dead elephant had already been hauled up onto a platform, “a kind of theatre,” as Fontenelle described it, ready for dissection. The African elephant had been a gift from the King of Portugal thirteen years before, and had survived many Parisian winters before finally succumbing the previous day. Four years old when she travelled from the Congo to Paris, she was therefore 17 at her death. She was not the only elephant in Paris; a young Asian elephant had been on show when she arrived at Versailles. But by the time of her death she was certainly the best known. In the summer, her many visitors could see her in an open pen; in winter, they could view her through the glass of her heated chamber. Artists came to draw her. She ate 24 pounds of bread and twelve pints of wine each day, supplemented by two buckets of “potage” or sometimes cooked rice. During her summer promenades through Versailles she pulled up grass with her trunk and ate it. Generally very gentle, she knocked to the ground an artist who teased her; another she soaked with water from her trunk. Her trunk was a marvel: she could untie knots with it, and one night opened the door of her enclosure without waking her keeper and wandered around the menagerie. Elephants had a properly royal history in France: the Caliph Harun al-Rashid had sent Charlemagne an elephant named Abul-Abbas, and Henri IV sent an elephant he owned as a gift to Queen Elizabeth in 1591. During the reign of Louis XIII, an elephant made a progress through France. 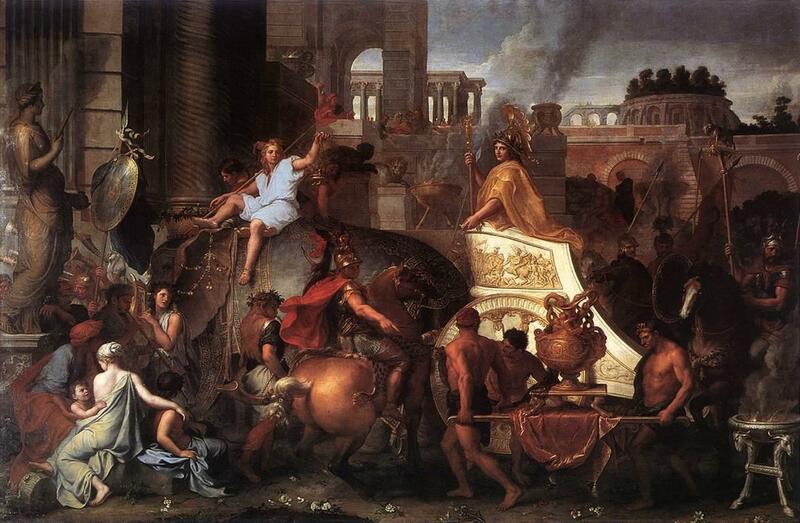 An elephant figured prominently in the fourth of five paintings in Charles LeBrun’s series The Triumphs of Alexander. The painting, Triumphal Entry into Babylon, completed around 1670, depicts an African elephant like the one at Versailles rather than, as the subject might have demanded, an Asian one. The series was much copied in tapestries and engravings. Such a wondrous and enormous beast as the Versailles animal (eight and a half feet long, seven and a half high) held great interest for Claude Perrault and the Academy. Few previous dissections of elephants had been made, and much about the anatomy and even the external morphology of the elephant was unknown. Perrault and the Compagnie carefully examined and measured the elephant’s exterior, even scrutinizing her skin through a microscope. It took over twenty pages in the printed description (only published in 1733) before the anatomist Duverney made the first cut. He proceeded slowly and methodically, removing individual organs and parts, including the trunk, to be transported to the Academy for further examination. Perrault took detailed notes and Philippe de La Hire sketched. They discovered that the elephant, which had been thought to be male, was in fact female. At some point in the proceedings, when Duverney was literally immersed in the beast, King Louis made an appearance and demanded to know where the anatomist was; presumably he knew Duverney as one of the tutors of the Dauphin. In Fontenelle’s words, Duverney “rose from the flank of the animal, where he had been, so to speak, engulfed” and greeted his king. Even with winter weather, the parts of the elephant would soon have begun to deteriorate, and the Compagnie met the following Sunday and Monday as well as on their regular Wednesday meeting to witness Duverney’s dissection of the head and other parts, accompanied by Perrault’s explanation. Dissection of the trunk extended into the middle of February. The reading of Duverney’s memoire of the dissection and Perrault’s account of the exterior occupied several more weeks. The Compagnie was still talking about the elephant the following summer, and she featured prominently in the Academy’s annual report to Colbert. A year later, the Compagnie met at the King’s Garden to look at the elephant’s skeleton, which had been assembled there. The skeleton’s interest lay mainly in its enormous size and the fortuitous structure of the elephant’s defenses that made her such a deadly foe, and that made her gentleness at Versailles all the more remarkable.